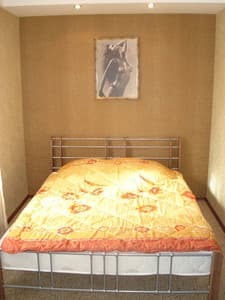 The cozy apartments "Lux Apartments on the Patriotic" are located in the center of Zaporozhye in the area of ​​the Festivalnaya square near the convenient transport interchange. The apartment can accommodate 4 people. The apartments are equipped with a double bed, a double convertible sofa, a wardrobe, television, Wi-Fi access, air conditioning, laundry, drying and ironing facilities, hairdryer. The kitchen is equipped with a refrigerator, microwave, stove, oven, electric kettle, crockery. The car guests can leave in the yard near the house. A two-minute walk from the Lux Apartments on the Patriotic Apartments is the food shop, the Afrikaan café, the Billa shopping center, the Kazak Palace exhibition center and the bank. The distance to the railway station is 6.5 km, the bus station is 5.5 km. Description of the room: One-bedroom apartment is suitable for up to 4 people (2 double beds). The apartments are located on the 2nd floor of a 5-storey building. The apartment has: a water heater, clothes dryer, iron, ironing board, bed linen, two towels, two pairs of slippers, shower gel, shampoo. Excellent view from the window, there is a balcony. В квартире кондиционер, относительно чисто, из заявленного в акте заселения все было включая постельное, тапочки и посуду, техника в квартире хорошего качества, тихое место, не было неприятного запаха. Квартира хорошая, все необходимое есть. Расположена в хорошем районе , рядом все есть. Добраться можно любым транспортом. 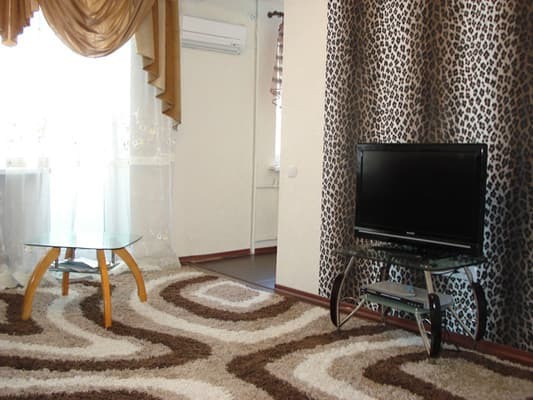 The apartments are located in the center of Zaporozhye (area of ​​the Festival Square), a 1-minute walk from Lenin Avenue (100 meters). From the railway station you can get by bus №3, №46, bus station №3, №46, №61. The distance to the railway station is 5 km, the bus station is 4 km.